By the fourteenth century the great age of cathedral building was over. Patrons and donors shifted their interest from large public monuments to the commissioning of private devotional objects. The sophisticated carving and rare materials of this small ivory suggest that it was destined for personal veneration by a patron of high social standing. 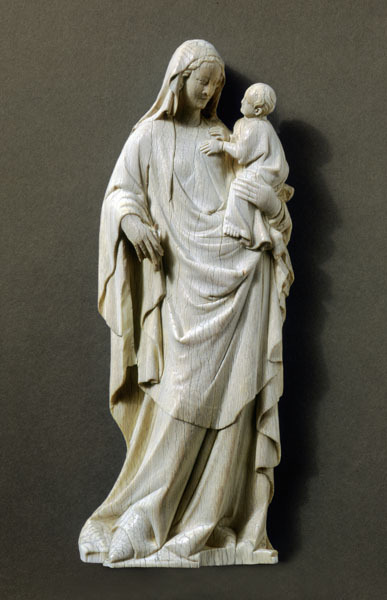 Reflecting artistic skill of the highest level, the feminine grace and courtly elegance of the Virgin and Child are underscored by the sway of the figure and the liquid movements of the garment folds. Traces of gilding and color can be seen in the border of the Virgin's robe. To possess an object of this quality validated the privileged social status of the owner.